A healthy diet is one of the key contributors to child development. We are fortunate to have a dedicated and hardworking staff running our school canteen. 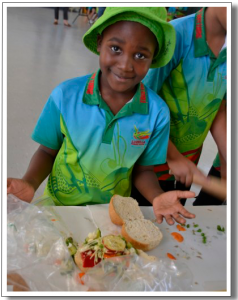 They provide simple healthy items at recess and a range of sandwiches and hot food at lunchtime. The Canteen operates from Monday to Friday and complies with the Department of Education and Training’s Canteen, Nutrition and Healthy Eating Policy. Ludmilla Primary School in conjunction with the Australian Red Cross runs a breakfast program every school morning from 7.30am to 8.20am. Cereal, toast, fresh fruit, and Milo are provided. This is a free service with no cost to families. All Ludmilla school students are welcome.